KRAKOW, Poland (CNS) — Tara Gouldring never thought of herself as a missionary to others. 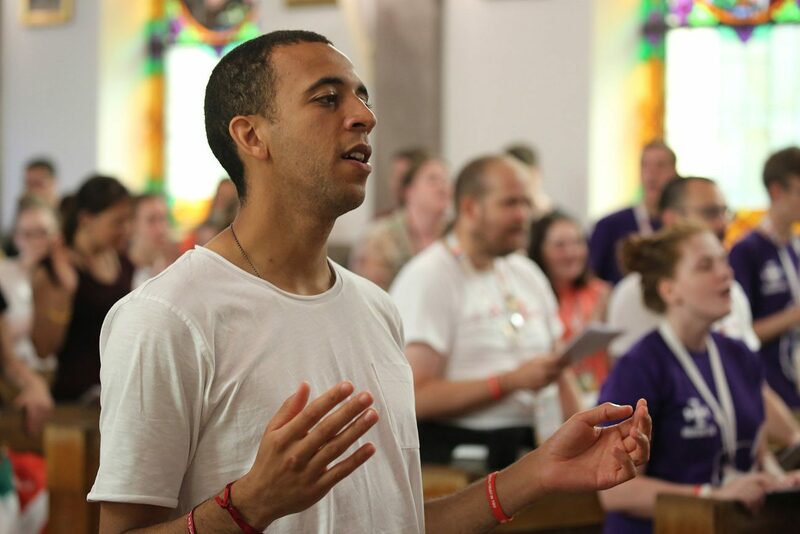 But the 18-year-old from Birmingham, England, decided it’s not such a strange idea after hearing Bishop Frank J. Caggiano of Bridgeport, Connecticut, during a morning catechetical session July 28 during World Youth Day. “It’s inspiring to see God’s mercy in so many ways and how I can bring it into my life and how (to) love people even though they do you wrong,” Gouldring told Catholic News Service. “You can start with prayer for people who need help and hope to help more from there,” she said. Bishop Caggiano’s talk at Sacred Heart of Jesus Church focused on the idea that anyone can become a missionary of mercy by showing compassion, love and a caring attitude toward anyone who is suffering. He took the 150 young people in the church, most from the Archdiocese of Birmingham, England, back to the days before he became a priest. He was a sales representative for a major publisher in New York City, and on his way to work every morning he saw a homeless man in a plaza along the Avenue of the Americas. For weeks, he said, he ignored the man. “I was so self-absorbed it took me two months to realize this was a man there. I would literally step over him,” the bishop said. Soon, he began giving the man $1 every day. “I thought I was giving him what he needed. I thought I was doing something good. I thought I was an OK Catholic,” he said. Today, he realizes he was being far from merciful. “My friends, that may be good enough for the world, but that’s not good enough for Jesus Christ. That is not what we are being called to do. We are being called to more than that,” Bishop Caggiano explained. Then, dressed in the traditional bishop’s cassock, waist sash and zucchetto, he got down on his knees and acted out how he should have responded. Acting with mercy can occur toward anyone at any time, as long as it is done to follow the example of Jesus, he said, suggesting that World Youth Day 2016 can be the start of merciful actions on the part of everyone attending the six-day celebration of faith. “Is it easy? No. Is it going to be something you and I will fail at? Yes. Are we going to learn from failure? Yes, because Christ will love us,” Bishop Caggiano said. The bishop, who was the U.S. bishops’ episcopal liaison for World Youth Day, called on each member of the audience to become a missionary of mercy one person at a time. Bridget Phiri, 20, of Wolverhampton, England, said she saw herself in Bishop Caggiano’s story of giving money to the homeless man in New York. “Instead of just handing people money, I should get up and give them a hug and make them feel like they’re a person too, like they’re accepted in society. Something more physical than just giving them some coins and walking by,” she said. “I think I need to re-evaluate how I look at things now and how I act toward people who are homeless or less fortunate,” Phiri said. It comes down to letting God flow through each person’s action, concluded Toby Duckworth, 21, of Streetly, England, who will enter the Venerable English College in Rome as a seminarian in August. “The challenge is to go beyond what the world sees as mercy. To go beyond even what we as human beings think is merciful. To me that is constant challenge, always, everywhere,” Duckworth told CNS. Returning home to England and elsewhere, pilgrims will find it difficult to go beyond their normal circles, he acknowledged. But such work is never easy. The challenge is “be Jesus to others,” he said.